For our exclusive interview with Terry Young of my Sweet Patootie by Pete Austin please click here. Ever changing musical styles have ensured there are always new sounds in which the listener can immerse themselves and enjoy to the full. Kettering Arts Centre is pleased to announce that as part of a 21-date UK tour the award-winning trio, My Sweet Patootie, is dropping in to present their unique blend of vaudeville, contemporary roots and ragtime repertoire. 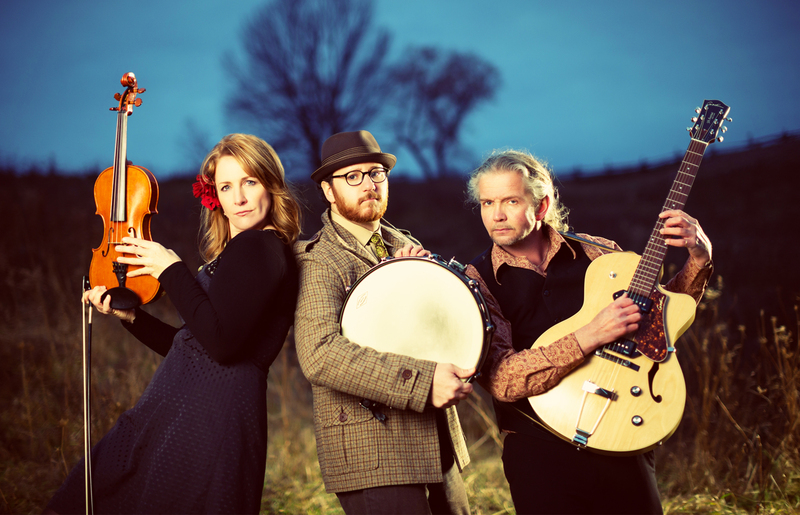 The Canadian Folk Music Award winners Sandra Swannell, violinist/ vocals and Terry Young, vocals/ guitar are joined on this tour by UK percussionist Anthony Thickett. Drawing upon their respective love of artists ranging from Patsy Cline and Hank Williams to Stephane Grappelli, Les Paul, Chet Atkins and the Andrews Sisters it is no surprise that the end result is a delightful melange of musical magic. Classically trained violinist Sandra and Terry both make the strings sing as concert goers sit transfixed as they are regaled with everything from original swing tunes and funky fiddle-tune arrangements. Add in some tight vocal harmonies (Terry is a classically trained vocalist) and exquisite ballads and you have one not-to-be-missed musical extravaganza. Although only founded in 2007 there is a wealth of musical experience within the group. Terry toured with Tanglefoot from 1999 – 2009 whilst Sandra fronted the Celtic art-rock band The Shards before joining also joining Tanglefoot in 2005. Should you be wondering how the group chose their name it dates back to the golden age of jazz when in the 1920’s the phrase was a slang term of endearment meaning a “hot dame” or a “sassy sweetheart”. In particular “Sweet Patootie Blues” (1928) by Arthur “Blind” Blake, who was well known for his complex and intricate finger picking, not only defines this group’s vintage flavour of music but also the satirical edge which flavours much of their own song compositions.